If you’re looking for a flash, bang, wallop of a blog post – you’ve come to the right page. Not only is the Sydney Film Festival (4-15 June) lighting up the celebrity hype in the city shortly but also Cremorne Point Manor would like to thank the (TripAdvisor) academy for awarding us their ‘Certificate of Excellence.’ This is incredible for us since it’s the FOURTH year in a row of being a recipient! Yes, nearly half a decade worth of consistent awards so gosh, you’re in good company when you come to stay at our affordable, Sydney hotel. Now back to the Film Festival and 12 days of talent that brings in a huge crowd from locals and global creatives. Since the Festival’s grown so rapidly since mid last century after inspiration from the Edinburgh Film Festival, film makers showcase their movies over several venues. These include documentaries, family films, animations, short films and retrospectives. By the 1960’s and the sheer volume of budding Martin Scorsese’s, the subscribers exceeded 2,000. Originally located at the University, the Wintergarden in Rose Bay became the new home and by 2007, live gigs, shows and cabaret screenings at Metro Theater saw the Festival start to sweep around the whole region. With a flip flop effect of ‘should we make this a competition or just a showcase’ over the years, the consensus now validates that audience members can vote for popular awards alongside industry prizes. With 10 awards up for grabs (we nabbed the TripAdvisor 4 years in a row ‘Certificate of Excellence’ so that’s taken. Oops, we already mentioned that! ), these include the Sydney Film Prize, Peter Rasmussen Innovation Award and the Audience Award for Best Documentary. Think the Award’s only for up and comers? Well take into account that past participants/winners include Steve McQueen (12 Years a Slave) who won the Sydney Film Prize for ‘Hunger.’ This year’s lineup includes Danny Boyle, Zach Braff and Gia Coppola - granddaughter of Francis Ford Coppola so you’re seriously in good company at this Festival. Gia’s showcasing Palo Alto featuring James Franco and Emma Roberts so you may see a few stars in the sky and on eye level, accounting some films are showcasing from 10pm. You can buy individual tickets per movie or purchase Flexipass for 10, 20 or 30 movies so for the 30 movies, at $360, you’re paying $12 a film. That’s not a bad deal when you think about the cost of a standard cinema ticket and for die hard film buffs, this is like heaven in the Southern Hemisphere, right? Oh no, the orchestra’s playing. A finale thank you to you, you and you! If you’re visiting Sydney from May 23 to June 9th, then you’re in for a serious gallery treat! Vivid Sydney is an elaborate annual event that focuses on ideas, music and light with an outdoor gallery of incredible lighting sculptures. Enjoy from contemporary music programs and the mind blowing illumination of the famous Sydney Opera House that lights up the city like you’ve never seen before. As one of the most visually creative events of the year in Australia and Asia-Pacific region, you can watch the city turn eyeball after eyeball with a hub of activities. This event is ideal for entertaining clients, showing off to visiting friends if you’re a local, and truly hits a new spot for kids who are bursting with creative ideas. Since 2009, the creative industry movers and shakers, artists and innovators have transformed this prime city into a canvas where technology, commerce and art meet…and blast you with colour. Some of the world’s most influential creative forums alongside free public exhibitions (and outdoor lighting sculptures and installations) truly is a showcase of how ideas can blast through a city. From live performances, lighting that blows the Olympic ceremonies out of the stratosphere, it attracts thousands of attendees, so this is the show not to be missed. Over the 18 days of eye candy, you can check out the Harbour Lights, Martin Place, Aquatic Nights and the Star on 23 May amongst a flurry of others installations. With the Light the Bridge (the most popular installation) and The Star (at the Astral Tower, Darling Hotel and Sky Terrace), if you thought New Years Eve in Times Square blew visuals out the water, then you’ve not seen Vivid in full glory. Also put your sunglasses on as the University will host an eight day celebration for the first time. The University will be transformed into an interactive canvas of light and performances from May 27 to June 3. From workshops and entertainment to music , live performances and seeing local artists work with students to produce ideas that absolutely hits the left and back brain, this is something you want to mark in your diary. With around 15 events a day throughout the city, where better to rest your retina than at an affordable Sydney hotel, a short ferry ride from the Harbour. From there, you can view the Opera House at sunset, lit up in an array of colour that even a camera can’t capture so make sure you Instagram video it and share socially. Your friends seriously won’t be able to believe their eyes that you saw this first hand! From the 21 March to 9 June the annual Biennale of Sydney’s international, contemporary art festival (yes, the title pun was intended) is the largest and most well attended event in the country. With visual arts that are on par with Venice and Sao Paulo, this is one of the longest running exhibitions of its type. It’s also the first biennale to be created in the Asia-Pacific region which adds to its kudos, credentials and quality of art shown. Each year, a new theme is chosen and this year’s is: You Imagine What You Desire, Artistic Director: Juliana Engberg. There was slight controversy about this year’s theme and attempts were made to boycott this 19th Biennale – which simply adds to the publicity and attraction. The focus of the boycott was related to interests of asylum seekers and the chief sponsor, Transfield, who oversee and manage detention centers. As a result of hype and interest in this topic, Transfield were severed from endorsing or having affiliations with the Biennale. From so much awareness of this topic, the Biennale has been attracting more visitors than previous years, in support of and interest related to the artists exhibiting. Sometimes controversy does add to a positive outcome so if you’re in the Sydney area during your travels, enjoy the incredible artwork by these talented (and tenacious) artists at a host of locations including Carriageworks, Art Space, Museum of Contemporary Art Australia, Around the City and Cockatoo Island (Sydney Harbour). Some of the most famous, global artists exhibiting their work include James Angus, Sol Archer, Rosa Barba and Yael Bartana. Their featured creativity are a mix of traditional, contemporary and modern technology that will stun you with a range that includes light installations, humans, canvas, political stances and religion. For example Yael’s brand new work ‘Inferno’ shows visions of destruction (historical and present day) alongside her religious belief in ‘imagined.’ Then there’s Egle Budvytyte who features a mobile performance ‘Around the City’ called the Choreography for the Running Male where literally, a group of men jog a specific route through Sydney. They’ll carry out pre-meditated choreographed gestures and emotions from shame to seduction or a military stance. The objective is to realize socialized behavior that infiltrates our public consciousness. The diversity of artists and their showings are an education in itself! Exhausted after a full day of analyzing art? Then hop over on the ferry from the Harbour to an affordable Sydney hotel, relax with a drink and watch the sun go down while you focus on your untapped, inner creativity. 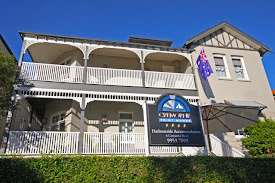 While you’re checking Cremorne Point Manor, take a look at our new tour video on the home page. It’s pretty sensational and shows Sydney in a stunning light and a work of art, in itself!